Derry city was a different place in the middle of the 1980’s. If you had suggested back then that it could become a City of Culture the locals would have laughed at you. Back then it looked more like East Germany than La Rive Gauche. It was in the middle of a war, for a start. There were checkpoints at the end of most main streets, there was barbed wire and speed ramps and heavily armed foot patrols of jumpy British soldiers. Anxiety ruled. Thinking back I remember now that I always used to walk through the city center pretty fast. The concern that you could get shot, or caught up in a protest, or worse, was always very real. Derry people themselves seemed to take it all in their stride but we were the Donegal boys. We lived in a giant landscape of loughs and green hills and ease and light and they lived in grey tenement streets under the all-seeing eyes of hovering helicopters. That contrast made them different in their eyes and ours. When Derry teenagers came to my town for their summer holidays they befriended us and dated us but secretly they laughed at us. We were hobbits to them, cute but clueless bumpkins that lived in picturesque hobbit holes. It became clear they thought of themselves as emissaries from a terrific reality that we couldn’t understand. They used to laugh at us when we told them we could. It was the first time I played the who’s the most oppressed game, which I have always seemed to lose. I’m writing about Derry City this week because I ardently love it and because despite the good-natured contempt the locals had for us unsophisticated country lads, that historic city gave me a rich gift that completely changed my life. It happened by accident. One afternoon when I was fourteen I was on a shopping trip with my aunt. Ponds cold cream was cheaper in Woolworths it turned out, and they had many more varieties of it. She was fascinated by the options but I was restless. Whilst she debated with herself I wandered off. Ten minutes later I was outside a bookshop on Bishops Street looking in the window. In the 1980’s my town didn’t have a bookshop. No one I knew read books at all. The only novels I saw knocking around then where tossed in and out of peoples’ cars and handbags, books like The Thorn Birds and Lace and Secrets, overwrought stuff with overwrought covers. I walked in. There was a faint but unmistakably progressive vibe to the place. No one noticed the skinny teen gawking at all the books but I didn’t miss a thing. That afternoon I was introduced to James Baldwin, Oscar Wilde, Patrick Kavanagh, J.D. Salinger, Jean Genet and Edmund White. Irish poet W.B. Yeats said that education is not the filling of a pail, but the lighting of a fire. How correct that is. At the time The Bookworm Community Bookshop in Derry was the most unprepossessing of places but its books lit a fire in my head that started me on a rich journey. I owe a part of my life to it. A few days later I had a conversation with my aunt as she rubbed her scented cold cream into her hands. I mentioned how the prospect of death could make the struggle for existence look absurd. She looked at me like I had started speaking Afrikaans. In a way I suppose I had. The Bookworm, though the gift of reflection, which is the gift of art, gave me the opportunity to isolate and access my own life and the lives around me for the first time. It showed me that other lives were possible, not just the one you were given, you could reach out if you wanted to, you could try. Those books created a new space in the center of my life and eventually they inspired me to pick up a pen to write my own story. How can you put a price on that? Just a year ago, after 30 years of trading, I was shocked to read the Bookworms owner Peter McKenzie was forced to close the venerable shop after being hard hit by the economic downturn and the competition from internet booksellers. He got no support from the government agencies in the city to continue trading. They didn’t see how it mattered. 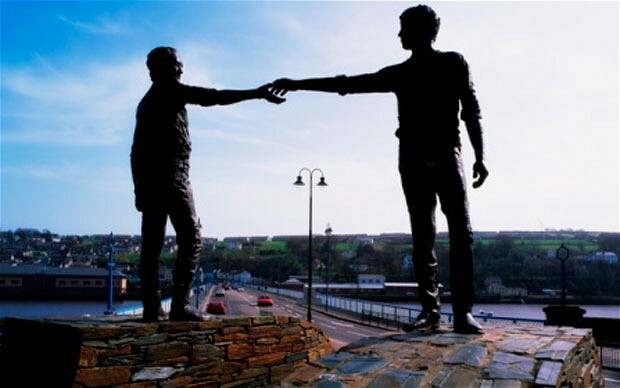 Next year Derry will be the 2013 City of Culture. But the light already went out on its most important and far reaching contribution to that culture last year. And no one noticed. Or almost no one.